The quartet was originally made up of four former members of the Dizzy Gillespie big band: John Lewis (pianist, composer, arranger), Milt Jackson (vibraphonist), Ray Brown (double bass player) and Kenny Clarke (drummer) and was first called the Milt Jackson Quartet. 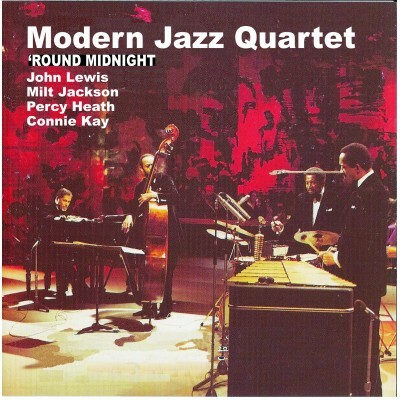 Towards the end of 1952 it took on the name of Modern Jazz Quartet and Percy Heath had already taken the place of Ray Brown. The first recordings aroused interest among the critics but were not wholly convincing. Only towards the end of 1954, after the group had been judged the best in the world in the Down Beat poll, did John Lewis decide to take advantage of the opportunities, He took over the role of musical director and laid down the rules on choice of repertoie, style and behaviour within the group and during concerts. In 1955, following disagreements, Lewis removed Kenny Clarke and hired Connie Kay in his place. From then onwards the line-up was not changed until it broke up in 1974 when Milt Jackson left, frustrated by the musical limits imposed by the leader. The last concert, given in 1974, was followed by seven years of separation. The Modern Jazz Quartet was reformed with the same members during a tour of Japan in 1981 (”Live at Budokan”) and nine months later for a performance at the Montreux Festival and occasionally at concerts and in recording studios. The M.J.Q. Preferred to perform in concert halls and theatres normally used for classical music, enhancing the discrete sound and quality of the music. In addition to choosing the repertoire, which mostly consisted of his compositions, Lewis took special care with the image (evening dress was compulsory for public performances and the dignified movements were in harmony with the music performed). The jazz performed by the M.J.Q. Was defined “chamber jazz” Lewis, basing on his cool jazz experience, had created an individual style using forms which approached cultured music, such as fugues and counterpoint. A skilful use of tones (piano and forte) created special performances, always impeccable from the point of view of form. The music expressed by the Modern Jazz Quartet was also known as “Third Stream”. The intention was to combine Afro-American music with revised elements from European baroque (integration). Given the acclaim obtained throughout the world, it can be said that the operation was a success. During its long career the M.J.Q. Had the opportunity of taking part in prestigious festivals such as the “Maggio Musicale Florentino” in Florence and the Donauschingen Festival of Contemporary Music in Germany. The quartet played and made records with top-name guests such as Jimmy Giuffre (alone and with the trio), Paul Desmond, Laurindo Almeda, Sonny Rollins, the Svend Seaby Choir, Diahann Caroll (the singer - 1960), the Maynard Ferguson Sextet, the Swingle Singers, string quartets and symphonic orchestra conducted by Gunther Schuller, jazz orchestras with famous soloists such as Clark Terry, Ernie Royal, Snooky Young, Kai Winding, Charlie Mariano, Phil Woods, Richie Kamuca, Joe Farell and many others.